The 300zx was slightly redesigned for the 1987 model year to boost sales as the original design "dated quickly". The redesign generally featured redesigned nose and hood, different style, larger wheels and a redesigned tail. 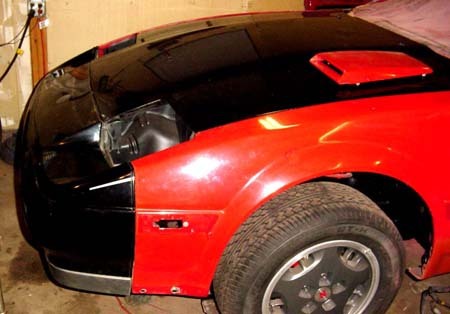 For the nose, the appearance became less angular and the bumper extended less, under the car. 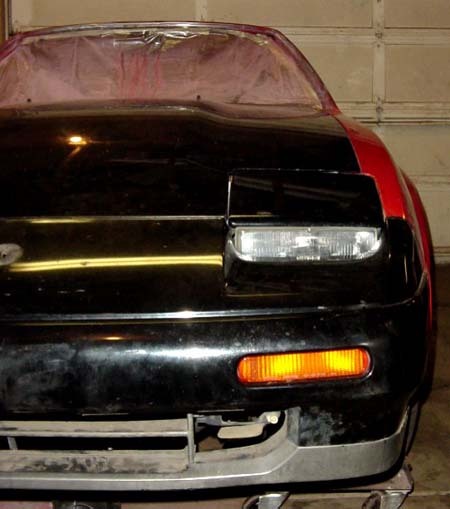 Additionally, the foglamps were moved into the bumper and a wider, replaceable bulb headlamp was used. 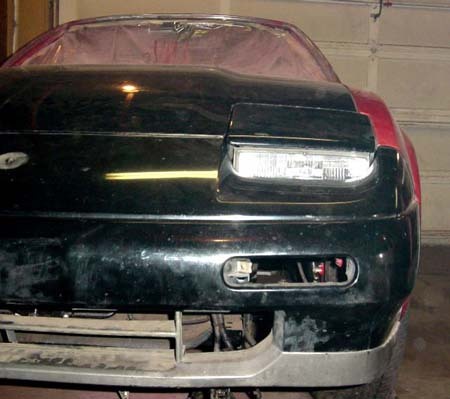 In my opinion, this style front end fits the "de-molded" 300ZX better than the angular nose originally installed. 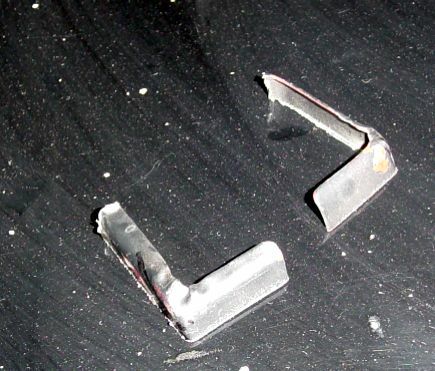 This is what was required on my 300zx (built June, 1984) to install the later style nose. For example, look at the pictures Below. The '88 is on right, the '84 is on the left. 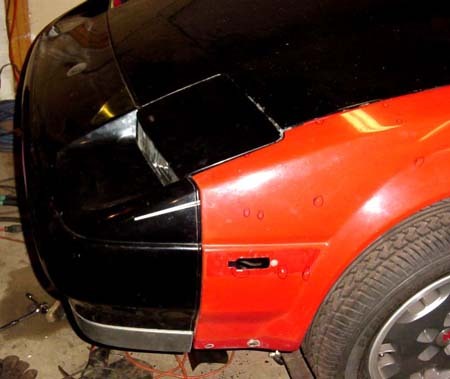 Often times, the front fenders from the '87 style 300ZX's are installed as well. These fenders differ in that they feature a very wide curvature into the wheel well, rather than the protruding flare style of the '84. 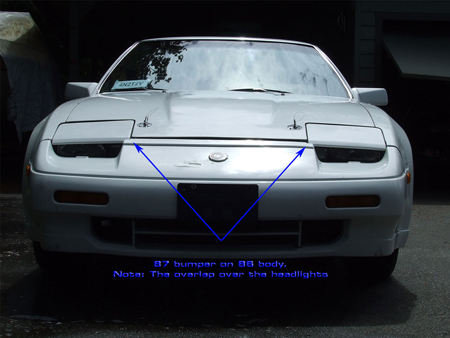 In my opinion, since the car has the flares in the rear, the '87 fenders don't look right. 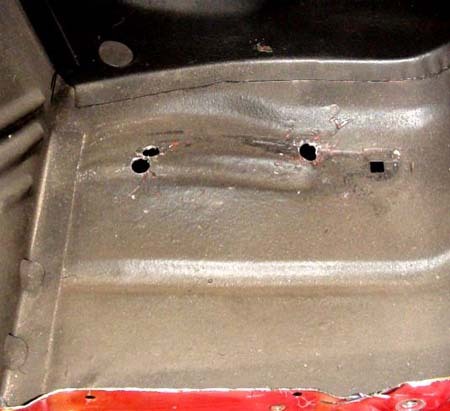 The hood should bolt on without an problems. 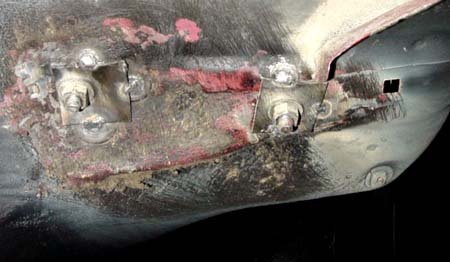 I did use the hinges from the '87 donor car and they bolted right up; if you're having problems here, try those. 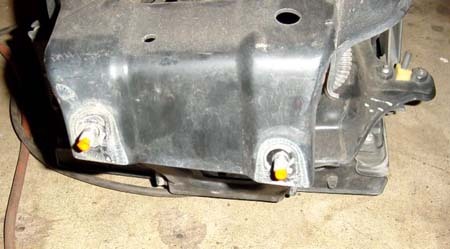 As for the bumper, there are two basic hurdles that make this a non-bolt-on installation. First, the '87 headlamp buckets use different mounting points than the 84. The approximate location of the different mounting points are provided in green. Second, the '87 upper bumper mount isn't as long as the one on the '84. 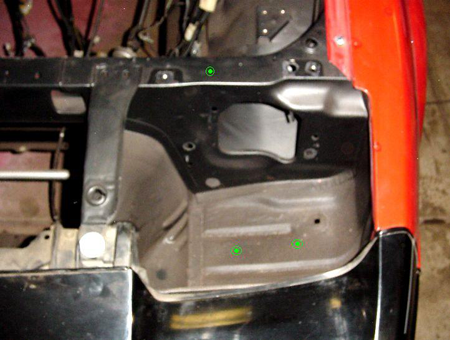 To allow the mount to bolt up properly, about 1/4" of material had to be cut from the ends as outlined in green. I used an angle grinder with a cutoff wheel; took about 10 seconds each side. This is what was removed. 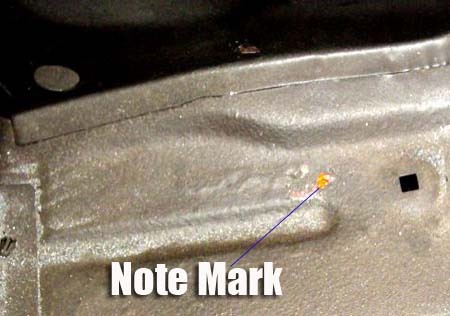 The upper mount bolted right up with this material gone. Aside from those points, all of the mounting points appear to be in the appropriate spots. 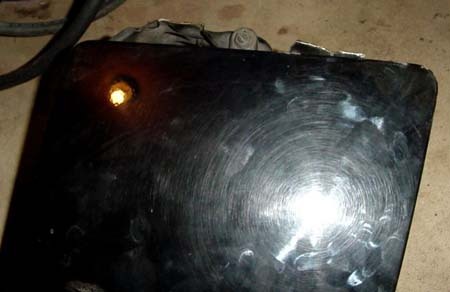 Here is a picture of what happens when you don't trim the ends of the top mount and use the 84-86 hood and headlights. From what I've read, regarding installation, the headlamp buckets should simply require me to drill a couple of new holes and bend the base of the bucket. Apparently, for some, this is the case ('86 model year?). Unfortunately, it was substantially more involved for me. One positive note, this is done right and looks factory. Here is a side by side comparison of the '87 and '84 style headlamp buckets. They are laying, headlamps down (the '87 is on the left). Notice that the '87 bucket is substantially deeper than the '84. 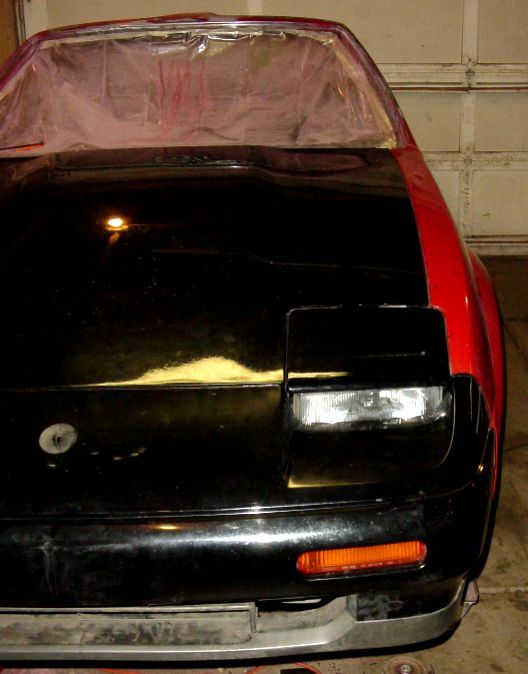 As you probably guessed, when the '87 headlamps are installed on the '84, they won't recess as the '84 bucket is not deep enough to accept the '87 assembly. 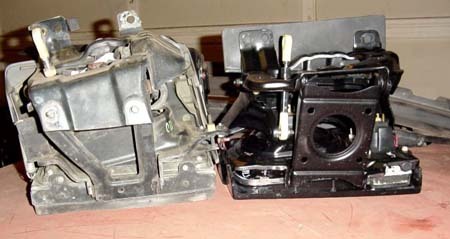 To fit the '87 headlamp, the front metal piece must be removed. 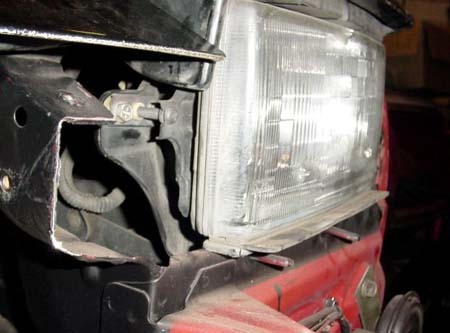 Based on the height the headlamp stuck up above the hood, approximately 3" of material must be removed. I used a 4 1/2" angle grinder with a 36 grit cutoff wheel installed, to cut out the metal piece. This was a rather disheartening experience as all the metal I've cut out of the ZX before had been corroded. 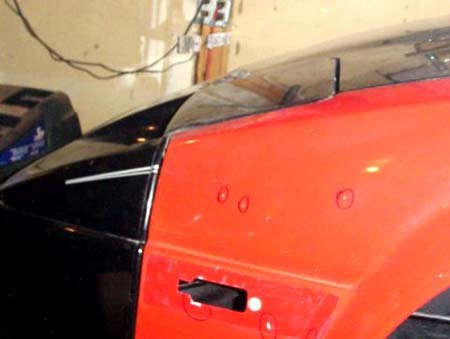 The '87 headlamp mounts to the car, differently than the '84 did. There are two studs on the bottom of the headlamp that mount through the bottom of the bucket. These must be drilled out to fit the '87 headlamp. To do this, I painted the studs with fluorescent paint and installed them. I then drilled the holes where the paint marked. I had to drill a couple of holes to get the left stud to lign up. Additionally, I had to elongate the holes, until I had everything adjusted. 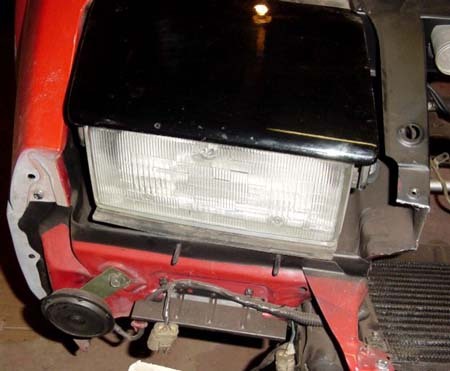 The '84 headlamp bucket is too deep on the inner edge, causing the headlamp to tilt substantially toward the radiator. To fix this, the bottom of the bucket must be bent upward, approximately 1 to 2". I used a body hammer, with good results. Once the holes are drilled and the bucket bent upward, the headlamp was test fit. 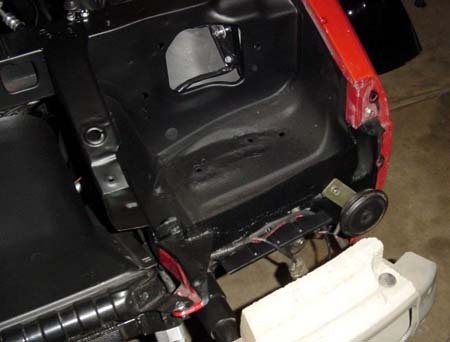 It was noticed that the brackets that mount the headlamp bucket to the radiator support, were too short; when installed, the bucket stood about 1/2" above the hood. To fix this, I cut off the brackets using the angle grinder and welded on replacement brackets, using 1/8" mild steel. 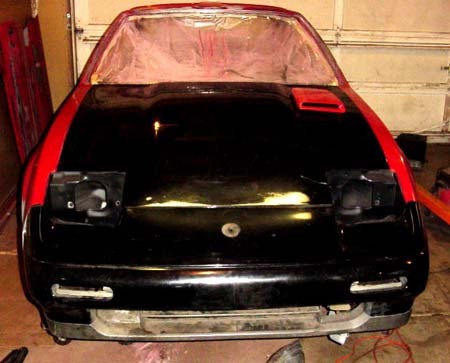 With everything modified, I then spent about 2 hours bending, tweaking and adjusting to get the headlamp to sit flush and angular with the hood. When everything finally lined up, I tack welded spacers to each mounting point, to ensure that the headlamp would line up again, properly, once removed. 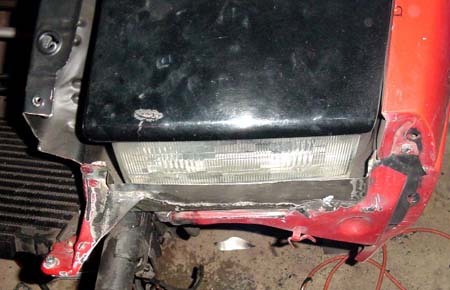 Finally, once the headlamp was installed and aligned properly, I rebuilt the front metal piece, using 22 gauge steel. The replacement is moved outward, from the original, about 3/4". (The funky looking black stuff is a weird reflection on the ground areas). 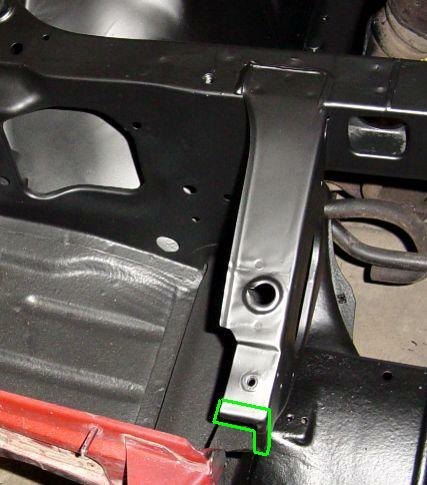 Once everything fits as desired, all welds and metal seams were brushed with 3M's brushable seam sealer. 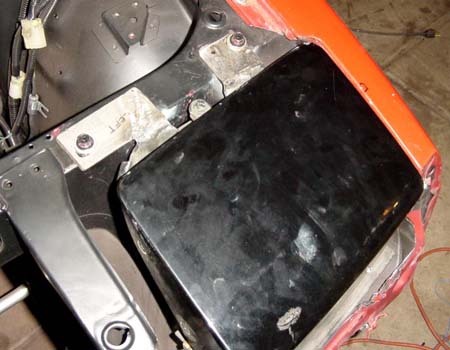 The base of the bucket was re-undercoated and the radiator support panel, headlamp bucket sides and new bucket from were repainted to match the underhood black. And the final results: This took me about 4 hours to do, non-stop. Hopefully, with the experience I picked up doing the driver side, the passenger side can be done in only a couple of hours. 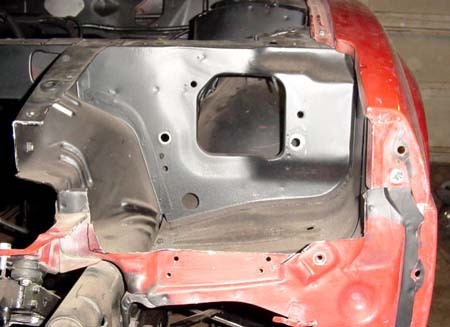 To finish the installation, all welds will be coated with 3M's seam sealer and then all surfaces painted black; the undercoating will be reapplied to both the inside and underside of the headlamp buckets. Additionally, I'll rebuild the headlamp buckets to new condition, as with the original buckets. I also plan on using aftermarket foglamps as substantially higher quality lamps can be installed for less than the cost of replacement foglamps from the dealership. Here are a few pictures taken, just because . . . hopefully, this'll motivate you either for or against this conversion, if your considering it but don't know if you really want to do it. The grey strip along the bumper will be continued along the fender, using strips formed from fiberglass.